Welcome to the James Clemens Chess Club & Chess Team page! Chess team practices during Refuel in Mrs. Simons' room #B110. Coach Paul Mulqueen leads Chess Team practice. The Chess Team competes in local, state and national tournaments. Jr Tournament Director Training - Monday Sept. 10th during Refuel in Ms. Simons' room. Chess Club will meet on the first Monday of the month during Refuel. Chess Club members have service hours requirements. Students can participate in both Chess Club and Chess Team. If you have questions, contact Ms. Simons. 2018-19 Competition Chess Team – starts Monday August 20th! JCHS will sponsor a competition chess team with practice starting on Monday Aug. 20th during Refuel in Room #B110 (Mrs. Simons' room). Registration information can be found here. 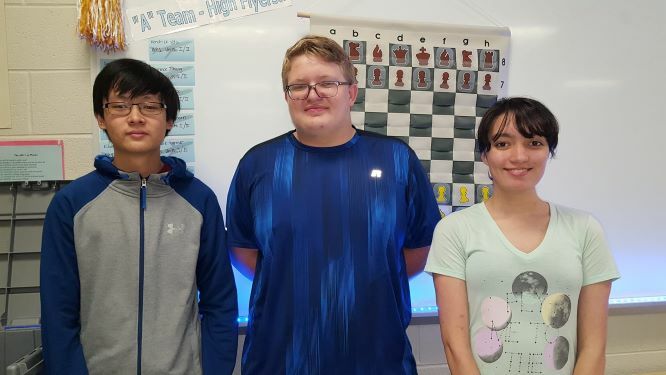 The JCHS Chess Team will compete at the National High School Chess Championship in Schaumburg, Illinois March 15-17, 2019 as well as the Alabama State Scholastic Chess Championship (dates TBD, but likely March 2019). The James Clemens High School Chess Club is a student service organization affiliated with the Madison City Chess League (MCCL), a non-profit organization that helps teach kids how to play chess and develop chess skills. There is no fee to join, but to remain in good standing, Chess Club members must perform 4 service hours per semester or 8 service hours per year. The service hours must be related to promoting chess in the community. Chess Club members also participate in a signature project that is selected by its members during the school year. Additional information can be found under Forms. Questions can be directed to mccl.director@gmail.com. Kids who want to play chess with other kids from across the city of Madison are invited to the Madison Library on Monday evenings from 6:30-8:00 p.m. when the Madison City Chess League holds its weekly meetings. There is no cost to participate. For more information, see www.madisonchess.com or visit the MCCL Facebook page . You can also contact the MCCL Executive Director, Ranae Bartlett, if you have questions: mccl.director@gmail.com. For more information about chess in the Madison community and upcoming chess events, go to the Madison City Chess League webpage. Register for your USCF id# here in order to compete at upcoming rated tournaments. For a complete schedule of upcoming tournaments, see http://www.madisonchess.com/events/upcoming.